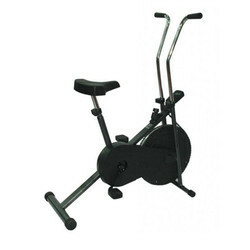 Our range of products include fitness cycle. Fitness Cycle is designed to execute daily exercises and burn the calories to get slimmer. It is equipped with a knob to adjust the strength and is having adjustable-reach arm that offer padded grip to avoid any accident by slipping. Practicing quiet and effortless full body cardiovascular workout, this cycle is installed in various gym centers and also can be used at home.